Arvi is somewhat similar to Potatoes and is cooked the same way. In this recipe it is cooked with aromatic spices such as carom seeds and fried in yogurt, mango powder etc to give a tangy flavor. Typical pakistani dish in which Tinda is cooked in tasty spiced gravy. Boiled spaghetti stir fried with veggies and a mix of sauces. It is a mouthwatering, healthy and a quick fix spaghetti or noodle recipe. 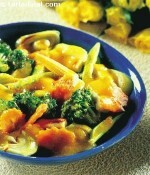 This recipe is a variation of the breakfast omelette, with an assortment of fresh vegetables and herbs. Stir fry vegetables with cashew nuts is a Chinese stir fry vegetables using assorted vegetables like carrots, baby corn, mushrooms etc. 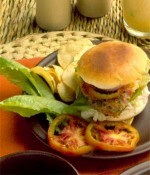 Shallow fried vegetable cutlet is placed in the burger buns along with cucumber, tomato slices and then enjoyed hot with mustard sauce and ketchup.